The NUCLEAR-ID® Red/Green cell viability reagent (Prod. No. ENZ-53006) is a mixture of a red fluorescent cell-permeable nucleic acid dye and a green fluorescent cell-impermeable nucleic acid dye that is suited for staining dead nuclei. The staining pattern arising from the simultaneous combination of these two dyes permits determination of live and dead cell populations by fluorescence/confocal microscopy. The reagent, supplied as a 1000x solution, is sufficient for 1000 microscopy assays. The single-tube format makes this cell viability reagent easy to use. It leaves the cytoplasm unstained, potentially allowing visualization of other cell markers. Quantity: 100μl (for 1000 microscopy assays). The NUCLEAR-ID® Blue/Green cell viability reagent is a member of the CELLESTIAL® product line, reagents and assay kits comprising fluorescent molecular probes that have been extensively benchmarked for live cell analysis applications. CELLESTIAL® reagents and kits are optimal for use in demanding imaging applications, such as confocal microscopy, flow cytometry and HCS, where consistency and reproducibility are required. Mix 1μl of NUCLEAR-ID® Red/Green Cell Viability Reagent in 1 ml of buffer of choice. This volume is sufficient for 10 assays and may be scaled according to need. Grow cells directly onto glass slides or polystyrene tissue culture plates until ~80% confluent via standard tissue culture practices. Dispense the freshly diluted staining solution in a volume sufficient for covering the cell monolayer. Protect samples from light and incubate for 30 minutes at 37°C. Remove the excess staining solution and, if necessary, add a few drops of buffer to prevent the cells from drying out. Cover cells with a glass cover slip and observe under a fluorescence/confocal microscope with a dual filter set for Texas Red (Ex/Em: 540/605 nm) and GFP/FITC (Ex/Em: 488/514 nm). Grow cells via standard tissue culture practices. Collect about 1 x 105 cells. Centrifuge at 500 x g for 5 minutes. Remove supernatant. Re-suspend cells in a volume of the freshly diluted staining solution sufficient for covering the cell pellet. Centrifuge at 500 x g for 5 minutes. Remove supernatant. Re-suspend cells in 100µl buffer. Plate 10-15µl of cells on a glass slide. 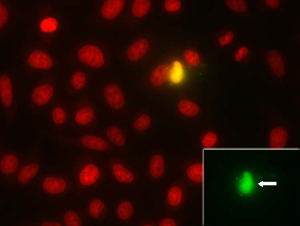 Figure 1: NUCLEAR-ID® Red/Green dye is detected as red-stained nuclei in live cells and fluorescent-green nuclei in dead cells (inset, arrow). Distinguishes between live vs dead cells in a single reagent.